Talk about fun. 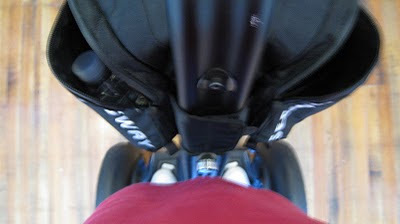 It reminded me of my days of downhill skiing – and what a difference a little weight distribution can mean. I used to call them “ski legs” – coming home from a week of skiing out west and then trying to negotiate the cubicles at work with the same speed. This is much the same, weaving around obstacles on the sidewalks. I was also reminded of my dad on my first driving lesson in his boat of a big Chevy – we had gone to a nearby mall. It was Sunday and, back in the day, there was no shopping then, so there were no other cars in the parking lot. My Dad’s car was his pride and joy and I was very nervous about driving it. It had a bench seat and I had it pushed completely forward so that I could reach the gas petal, forcing his knees almost to his chest. I remember him saying to treat the gas pedal as though it were an eggshell. We crept around the parking lot at 5 mph until a pop can appeared in front of the car. Gripping the steering wheel but not wanting to panic and swerve, I tried to straddle the can. Bad ideas as I had no idea where the tires where, and it was crushed underneath. So ended my driving lessons with Dad. Let’s just say I owe a big “Thank You” to Larry Connors – wherever you are – my boyfriend at the time who showed much patience in teaching me how to drive. Ah, but I digress...on this day I was trying to learn to “glide”. And it was much less complicated than learning to drive. 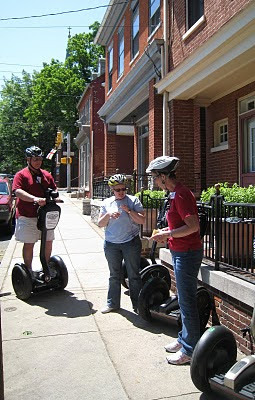 Terri and Bob Stauffer are the Chief Gliding Instructors with Red Rose Segway Tours and they do a great job of “training” you on the wonderful gadgets before you leave their office. With the slightest lean toward your toes, you go forward. And that’s when the fun begins. 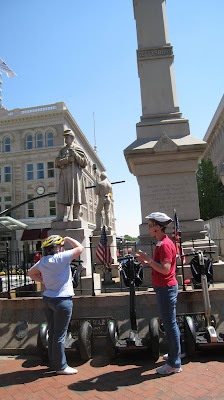 Lynne (Australian Walkabout) and I had a personal tour of Lancaster. And we saw things that we never noticed before...because we weren’t in a car. We had plenty of water stops and chances to take some pictures. We learned all sorts of interesting facts. Lancaster was a “first” for many things – Hamilton Watch Company produced the first watch here, Milton Hershey opened his first chocolate factory and Woolworth’s had their first Five and Dime Store. We discovered new places and heard a few stories. And everywhere we went, heads turned. People yelled out of car windows, waved from park benches and motioned for us to “pass” them on the sidewalk. 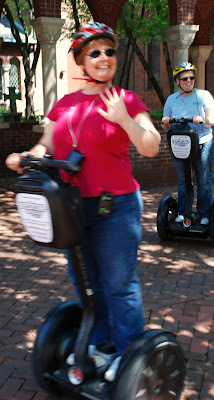 Seems that the segways just put people in a good mood. It was the first day of the Keys for the City. 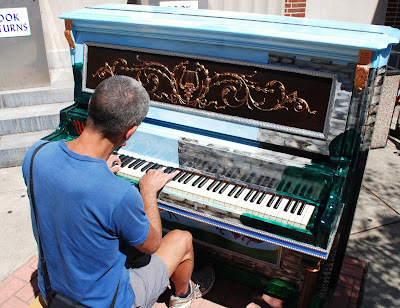 Chicago has its cows, Cleveland has its guitars, and Lancaster has placed pianos around the city. They wait in bright colors, welcoming folks to play them. Two girls were playing chopsticks as we glided through the square, and a guy on the next block was playing some piece of classical music – the name of which I would finally remember hours later. If you haven’t seen them yet, that is reason enough for a visit. 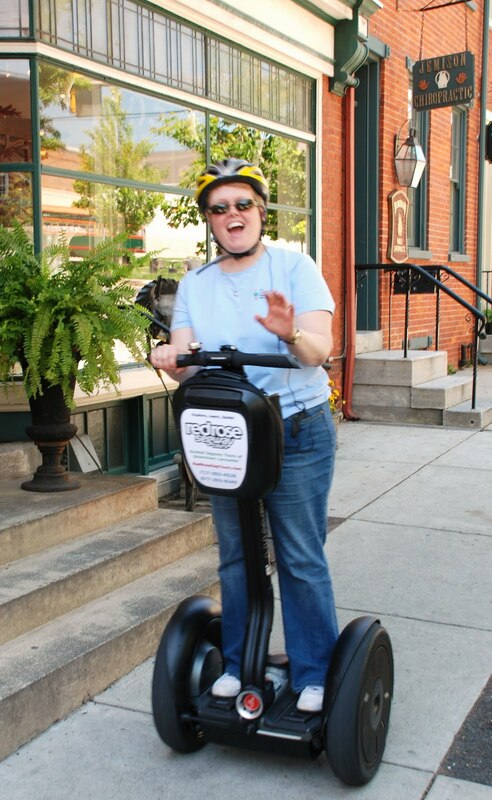 So, the next time you get the urge to improve your mood, go downtown Lancaster and hop on a segway. Terri and Bob make it fun. And if you stay at either Lynne’s (Australian Walkabout) or my B&B, The Artist’s Inn, you’ll be able to take advantage of our coupon – saving you $10 per person. how long have the pianos been there? I never noticed them in my travels before. We went for the tour on May 20 and I think they were installed the day before....can you play? WOW! A mention of little me in TWO of thses great blogs!! I'm humbled. We did have a GREAT time, though. I'm encouraging all my guests to try the segway tours. It was, indeed, a very unique way to see the downtown area. WOW...you are brave! I'd have been chicken to try them. 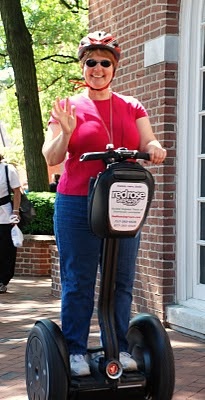 I do recall them being in use by Red Rose people during the AQS quilt show in March. What a fun post this was to read!! !